Pretty in Pink with Pink Blanket, she is wearing a cute pink nighty with lace trim and a matching bonnet. 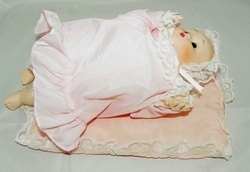 Pre-owned, doll was displayed, but not played with by a child. Shows some shelf wear, some cleaning on porcelain needed.